Klassen H., J.F. Kiilgaard, K. Warfvinge, M.S. Samuel, R.S. Prather, F. Wong, R.M. Petters, M. LaCour, M.J. Young. 2012. Photoreceptor differentiation following transplantation of allogeneic retinal progenitor cells to the dystrophic rhodopsin Pro347Leu transgenic pig. Stem Cells International 2012 Article ID 939801, 9 pages. Park KW. Cheong HT. Lai L. Im GS. Kuhholzer B. Bonk A. Samuel M. Rieke A. Day BN. Murphy CN. Carter DB. Prather RS. Production of nuclear transfer-derived swine that express the enhanced green fluorescent protein. 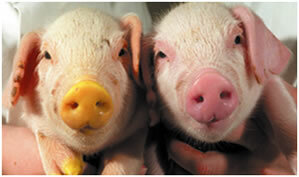 Animal Biotechnology. 12(2):173-81, 2001 Nov.